That goes without saying. My iPhone. It's been a paradigm shift for me, but I'm becoming more and more reliant on it, and feeling great about becoming paperless! Shopping lists, calendars, little notepads...all electronic! And it integrates so seamlessly with my Macbook! I never thought I'd (a) join the military myself or (b) marry a military member...especially after watching what my mother went through as a Navy Wife for 27 years! Offers by the Air Force for pay for my college was all the carrot-on-a-stick that I needed. But I soon realized that being in a military community is comforting to me...and I'm now nervous about how my life will be when none of us in the household is military. And that's coming up sooner than one would think! This is a toughie. I've had my REALLY REALLY REALLY hard days before...and usually it takes a very little reminder somewhere about what we're here for. On 9/11/01, my husband was TDY to downtown Seattle and I was very afraid for him. I was active duty at the time, and we were all busy with accountability and stuff, but I remember it was the unknown that is truly scary. "Was Al Quada intending to target other large American cities?" Precautionary measures were established in large metropolitan areas and my husband and I weren't even sure when we'd see each other again -- our colleagues were getting called to extended duty/deployment standby left and right. We were both grad students at the time, so we wouldn't be deploying, but I still have distinctive memories of that fear of the unknown. How did I deal? I leaned on my friends. I leaned very heavily on my friends...and they came through for me. Emotionally, and practically. Don't ever shut out the offers for help...ever! See #4 above. Spouses SHOULD be getting plenty of offers of assistance. At least that's always a goal of mine, and when my husband becomes a commander later this year, it will be a priority of mine. Don't be afraid to accept the help of others. It doesn't make you weak...it doesn't make you a bad spouse or parent. Allow someone else to watch your kids, even if it's 2-4 hours per month, to get out and spend some time to yourself. 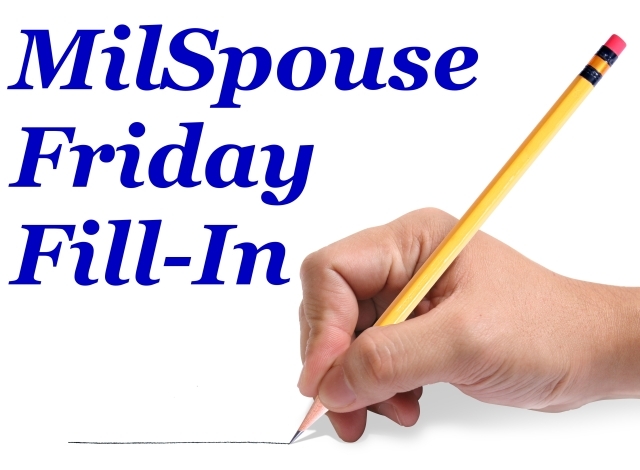 I know of spouses who committed suicide because he/she felt overwhelmed with keeping up with the house, the kids, and the emotional stresses of missing his/her deployed spouse. There's no reason to be overwhelmed...if all else fails, pay a visit to your chaplain or the Family Readiness Center. There are lots of programs out there...you aren't going through it alone!!! Not by a LONG SHOT! That Wisteria Book I Was Looking For...."The Floatplane Notebooks"
On the post I just wrote a few hours ago, I mentioned a book I had read several years ago that involved a very old wisteria, and how the author had personified it in several chapters. In my crazy search for the book's title (which mostly yielded references to ABC's Desperate Housewives), I found this forum that people use to find names of books they're trying to remember. Part of the AbeBooks.com website. I submitted a request, put in what I remembered about the plot and within 6 hours I had two replies. Thanks to Anna on the forum, I now can share the information with you! The book my book club read in 2006 was called The Floatplane Notebooks by Clyde Edgerton. One of the reviewers compares the literary style to William Faulkner's As I Lay Dying and they're absolutely right! 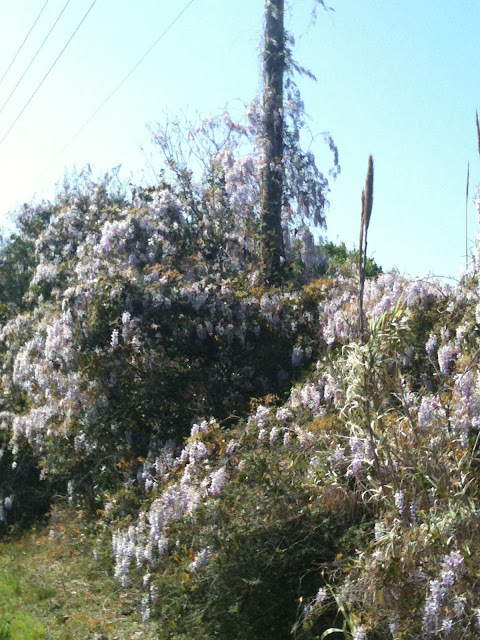 Florida Discoveries 5: Mass Wisteria! It's a 12.3 mile drive on U.S. 98 between our neighborhood in Navarre, and Dave's base to our east. That road is a nightmare a lot of the time; it's the only east-west artery along the Gulf Coast connecting Pensacola with Fort Walton Beach, so the majority of businesses set up on this road, and it's extremely congested. Dave probably has a dozen traffic lights on that 12.3 mile stretch (perhaps I'll count it the next time I make the drive and report back to you). As I wrote about recently, living on the Gulf Coast opens up a new world of flora and fauna. This being our first springtime here, it's been a surprise every week seeing what does grow in this area. We'd spent time on the East Coast of Florida in Melbourne years ago, and went from there to central North Carolina. The differences in flora between the two locations was profound. This area seems to be a blend between the two. Banana trees will grow, but so will bradford pear trees. This week brought out the wisteria. 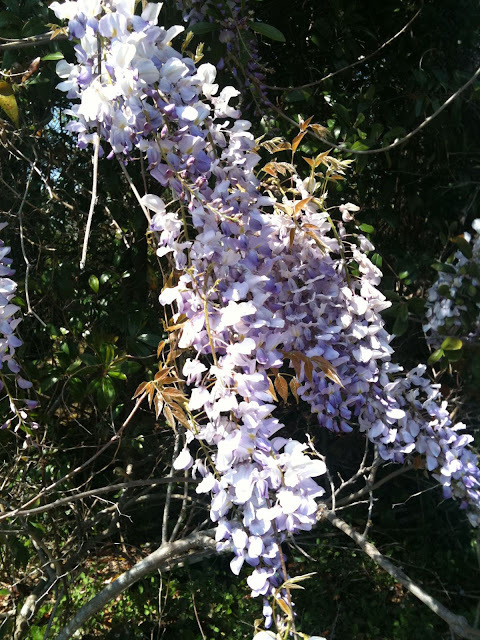 For those familiar with this invasive species, wisteria typically spreads their vines very aggressively, and many American cultivars don't flower until 10-15 years after first seeded. That being said, most of the wisteria I'm seeing in this area are in undeveloped plots of land. In my neighborhood itself, there aren't a lot of wisteria. Most of what I'm seeing is along that 12.3 mile stretch of U.S. 98. 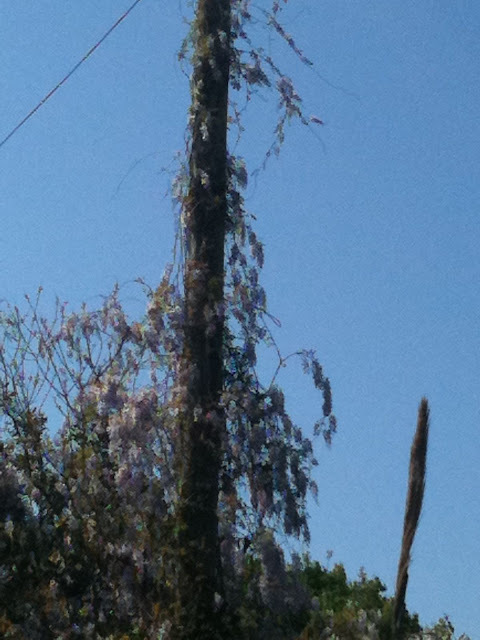 In these photos below, the wisteria vine has been allowed to grow for several years without any pruning, and it's growing up the telephone pole and draping itself over other large trees. I also noticed that this particular one wasn't as purple as others I've seen around. I've seen one very pretty plant in someone's front yard in my neighborhood, the only one that appears to have been planted in a particular spot "on purpose". It's clearly well-pruned every year, and it looks very attractive. I haven't gotten a picture of that one, I don't want to freak out the homeowners. I wanted to also discuss a book I had read with a book club I was in when we were living in North Carolina. But I can't remember the title or author! 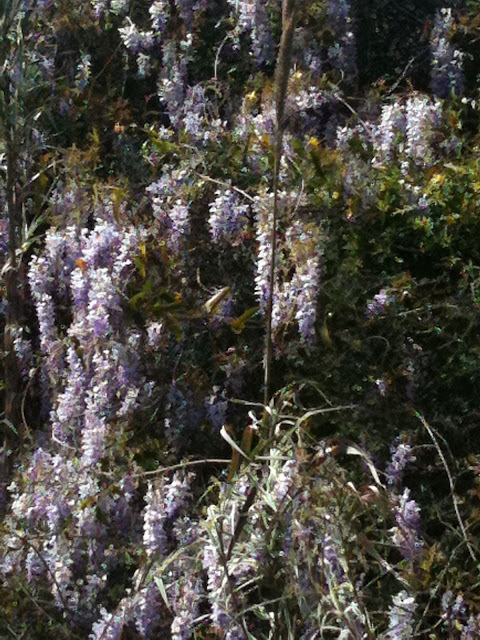 One of the "characters" in the book was the centuries-old wisteria on the family's property. It told the reader a history of the protagonist family...I thought it was clever and creative. If anyone knows the name of the book I'm talking about, please remind me! I found the name of the book! "The Floatplane Notebooks" by Clyde Edgerton! This is a huge sprawling wisteria vine! I wish this blog had smell-o-vision...they smell very very nice. Not as nice as lilacs or honeysuckle or good roses, but still nice. I wish I had my good camera with me, but I'm impress with how these iPhone photos came out. 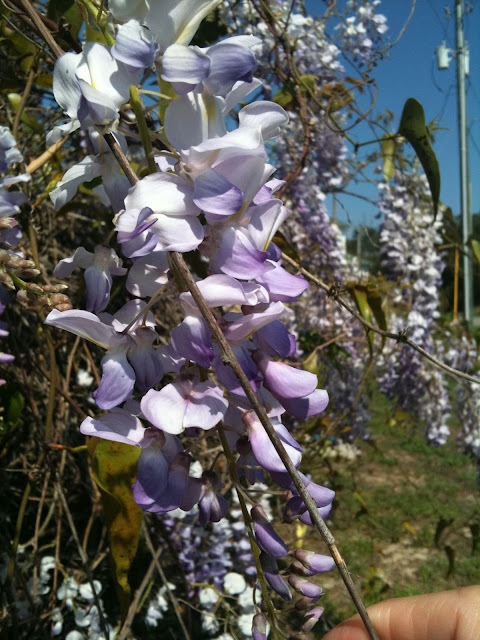 Like kudzu, wisteria is an Asian-originated vine of the pea family that grows VERY fast! It's been Spring Break here. Extremely early, I know, but allegedly my boys' school district here had some problems with their calendar and now the timing is "off" compared to the other school districts around here. Most kids I know of are having their Spring Breaks later in March, or even in April...with Easter being late this year. Unlike other Spring Breaks we've had, this time around we had nothing significant planned. 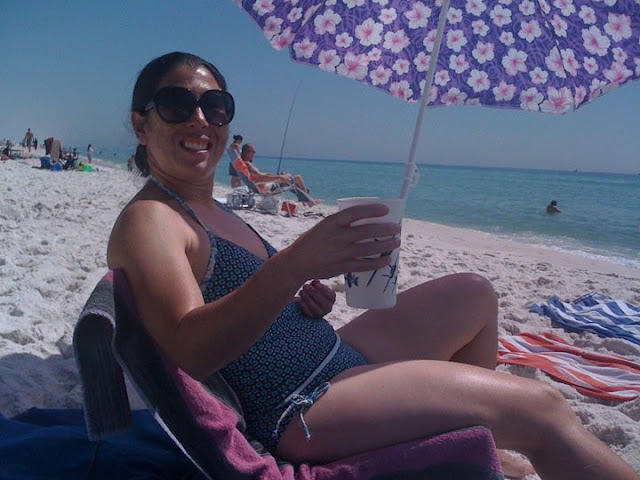 We visited the Air Force Armament Museum (for another blog post) and as the weather slowly warmed up, by midweek we took our first "real" trip to the beach! We'd been a couple other times since we moved here, but it was not really to play...more to look around. My boys LOVE the beach. They always have...they seem to be transformed into angel children. They play hard, they play well together, they're polite, they don't fight. They even eat the healthy snacks I bring for them -- without complaint! And they are worn out enough that I can even enjoy the good behavior for the rest of the day, and they go right to bed at bedtime. Now that both boys swim decently, I don't have to be in the water with them, and I can even blink a few times while watching them from shore. It won't be long before I could possibly read a book at the beach! On Wednesday we were lucky enough to set up near another neighborhood family and our kids had a great time playing together...so much so we got together again on Friday! Timmy let the girls bury him...unlike other "burials", the older kids dug a VERTICAL hole! Timmy did amazingly well with this -- even waiting for me to come back from the restroom to take a picture of this! We could see schools of fish swimming in this clear clear clear water! 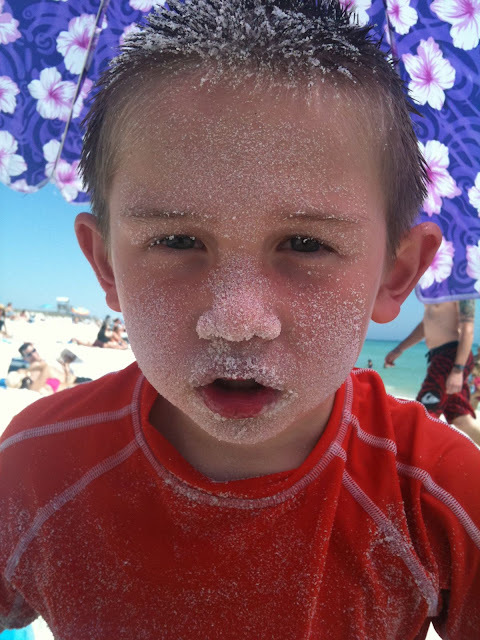 The sand really IS like sugar here! Jacob liked the purple umbrella when I was umbrella shopping at Walmart. It turned out to be unique enough, it's easy to see where we'll be parked on our beach outings! Timmy and his new friend would hold hands floating around...I don't think it's romantic, I'm not worried! On Sunday, with Dad not having to work, we spent yet another afternoon enjoying the beach. This time we hung out further east than before, where there are less people, and the waves are less active because of a sandbar about 100' out that takes the brunt of the wave action. After about 3 hours out, the boys and I took Dad to our new favorite hangout: Tommy's New Orleans Sno Balls! Timmy is face-planting himself here. Trying to make a face-print...seriously. Timmy lost his first front tooth over the weekend...we found a baby crab, but I think he was dead. Tommy's New Orleans Sno Balls -- it opened up a couple weeks ago and every time we pass the place there's a line. But it's yummy and cheap! Tommy's Sno Ball stand is just north of the Navarre Beach Bridge. A seasonal stand, it's been HOPPING this week!